Kia Ora is a comfortable, casual three bedroom, three bath vacation rental in Upper Chocolate Hole. Decks located around the house, both open and covered, provide both sun and shade with lounges, dining tables, and a hammock and lots of places to enjoy the fantastic views from St. Croix to St. Thomas. An abundance of tropical plantings surround the home. Colorful bougainvillea border the pool and bananaquits and humming birds flit from flower to flower and the resident iguana makes his appearance occasionally to bask in the sun on the pool deck. Kia Ora has a television room with cable television, VCR, and DVD. There is a wall mounted television with cable in the kitchen level that can also be seen from the living room. A stereo system with CD with a selection of CDs and tapes is in the living area with separate speakers on the decks. DSL is available is you have traveled with your computer. The dining room seats six people comfortably or do as most guests do in this St. John villa rental and gather around the outside table overlooking the pool for an al fresco lunch. Sit on one of the stools at the large counter and chat with whoever is doing kitchen duty. The kitchen is equipped with an electric stove, dishwasher, microwave, blender, coffee maker, toaster oven and refrigerator with ice maker. There is a full laundry and telephones and an answering machine. The living room has sliding glass doors on either side which opens onto a covered dining deck with a large gas grill on one side, and onto a large sun deck on the other, letting the outside in. The home is fully screened with ceiling fans in every room to help circulate the tropical breeze. 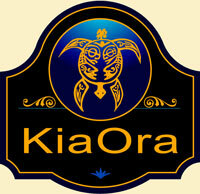 Kia Ora has three large bedrooms, each with an adjoining private bath. The master bedroom has a king bed and sliding glass doors which open onto the pool deck. There is a large bathroom with a garden shower. A second large air conditioned bedroom with two twin beds, which can also be made as a king, is on the opposite side of the home with an ocean view and its own deck. The third bedroom with two double beds is on the lower floor accessed by outside staircases on either side of the house. 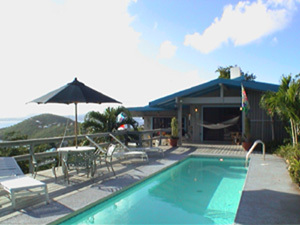 Kia Ora offers lots of privacy yet is only a mile from Cruz Bay center and less then a half mile to the Westin Hotel.